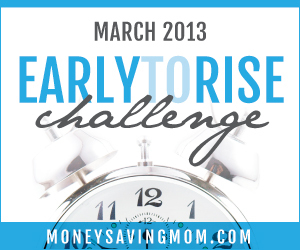 This is Day 17 of the Money Saving Mom Early To Rise Challenge! I should have done what the challenge told me to Friday. I had all intentions of going to bed around 10:00-10:30, but didn't get to bed until 11:30. And guess what happened when I woke up on Saturday? I was tired. Big surprise. Apparently not Sunday night. Last night I didn't get to bed until almost 1 am. That's right, I said 1. A. M. Now I'm not only tired, but BEAT. Drained. Exhausted. Depleted. Ugh. So, tonight we're going to bed "Stupid Early". I'm going to listen to the author and remember that in order to take hold of rising early, I need to get a hold of going to bed early. Today's passage encouraged us to "rest" while we are awake. Slow down and simplify our actions instead of multi-tasking our way through the day will not only improve our efficiency and focus but will help us enjoy and experience more. I personally vacillate between trying to get things done and be as efficient as possible and just wanting to "stop glorifying the busy". Most of the time I'm the multi-tasker. But I can see the author's point in that I don't enjoy nearly as much of my day, as usually I'm watching it pass by while I try to make my two hands into eight. Slowing down, especially with my kids is one area I'm really going to be intentional about this week. Making sure I give them my full attention, even when I don't want to or when I think I can't be interrupted in a task. Giving them my energy instead of giving the task I'm doing more importance. There will be times when interruptions are not ok, ex. when doing business on the phone, not just a casual conversation. But investing in my kids and giving them my focus will reap many more benefits long term than any amount of multitasking around them could. 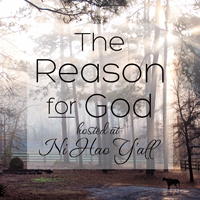 How are you going to slow down, and is there anything you are intentionally going to focus on because of slowing down? So what time did I get up this morning? Well, Fredrika went off at her usual 5 am, but I didn't get up until 5:25 am. D-baby was in bed with us after being woken up by a thunderstorm this morning. So I changed his diaper and got myself up and around for the day. 1. Go to bed EARLIER than 10:30 pm. "Stupid Early"
2. Rest, as in decrease the multi-tasking for today. 3. Be intentional about focusing on the kids as a result of the decreased multi-tasking.